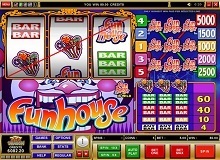 Designed by Microgaming, one of the most popular casino online game developers, Funhouse Slot is a betting machine that will keep you occupied for a while. If you’ve ever visited amusement parks or festivals, you’ve probably come across a funhouse, which is an amusement facility that offers different entertaining activities to the visitors. Microgaming developers were inspired by one of these facilities so they decided to recreate a funhouse in a unique slot machine version. 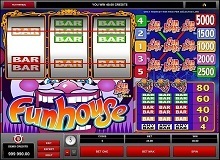 That is how the Funhouse casino slot online was created. It features vibrant colors and an upbeat tune that matches the atmosphere of a fun festival. The symbols of the game are very plain. 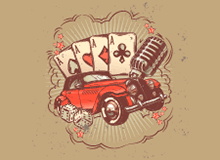 You will most commonly come across the classic casino bars in single, double, and triple versions. The slot has a retro vibe with classic settings and fairly simple gameplay with a total of three reels and five paylines. Even though it might look a bit silly at first, it is actually quite fun once you start playing. The retro design of the game features lots of buttons but once you become familiar with different options and features, playing the game will feel very natural and ordinary. If you want to play Funhouse Slot for real money, you need to place a bet before spinning the reels. Luckily, the settings of this casino online machine are quite simple and straightforward so you don’t have to spend minutes trying to figure out how the betting system works. Once you place the bet, you can check the paytable located on the right side of the screen in order to learn which symbols and combinations pay out the largest rewards. What’s great about the Funhouse game is that its rewards match the level of your risks, which means that placing more money on the stake will bring you larger payouts. However, it is completely up to you to decide the bet size in the settings options. Speaking of options, this slot offers you two convenient features, the max bet button and the autoplay button. The max bet button allows you to automatically bet the maximum amount of money, which opens up the largest number of opportunities for scoring great rewards. By hitting the autoplay button, you will allow the slot to spin on its own without having to place a new bet after each round. These two features certainly make the whole gameplay a lot easier. The game allows players to take home cash prizes if they land different combinations of the plain bar symbols. The only two other symbols you will find are the candy bag icon and the game’s logo. The candy bag symbol is quite rare but when it comes around it brings big rewards. Landing three candy bag symbols will multiply your initial bet by 80 times. The game’s logo is the wild symbol, which can replace all other icons on the reels. The wild is capable of creating the most valuable combinations in the game that are worth at least 1000 times your wager. However, the value of the wild symbols depends on which payline they land on. Unlike many other slot machines, Funhouse Slot allows you to stack combos diagonally. A diagonal combination of wilds, in this case, is worth a staggering amount of 5000 x your initial bet, which is also the biggest prize in the game. Unfortunately, the machine doesn’t feature any Funhouse free spins, which is a big disadvantage for players who love bonus rounds. Should You Give the Slot a Spin? 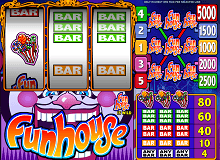 The Funhouse Slot is a unique casino online game in terms of its graphics and images. It is based on a fun theme park facility with lots of clowns and similar icons. The background represents a close-up of a clown’s face, which tells a lot about the overall appearance of the game. However, despite the silly imagery, the game is quite fun to play because of its dynamic atmosphere and vibrant colors. You should definitely give it a spin and play Funhouse for real money for a chance to win one of its enormous multipliers. On the other hand, some players might be disappointed by the fact that this machine lacks free spins and doesn’t have that wide of a variety of features. Despite these disadvantages, it is a good option if you want to switch things up and try something different every now and then. Just don’t expect to land winning combinations very often!